Let’s lighten it up after all that Holiday food over the weekend. Here is a delicious light salad dressing served over any salad you like with some protein is a perfect way to start the week. 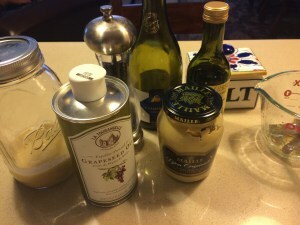 Even though I am unable to cook for the next few weeks due to shoulder surgery I will re-blog some of the recipes that I would be cooking around now. Enjoy it for me! 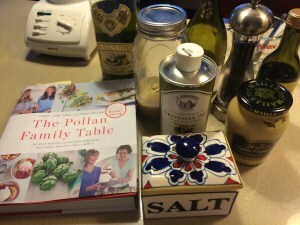 I am in love with this new cookbook “The Pollan Family Table” . If you’re in the market for a new cookbook I highly recommend it. I made the “Pollan Signature Salad Dressing” tonight and it is delicious. 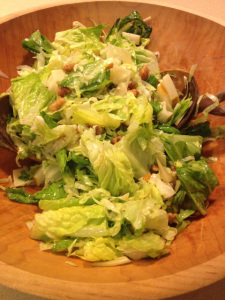 Here is the recipe for the dressing, I used greens, candied walnuts and pears and shaved parmesan. You can use it on any salad you like. You’ll need a tight-fitting jar or another jar that you can keep dressing in. I also did it in a blender but you can use a bowl and whisk it together and use right away. 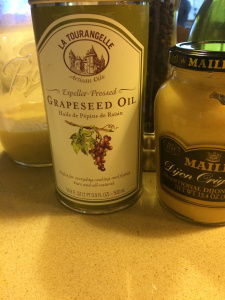 I was making it for later and I like the way a blender emulsifies the dressing . I love a Ball Bell Jar to store dressing in. Thank You to the Pollan Family for the cookbook and the recipes. This is what I did .